Hello everyone! I am back to talk about some juicy foils today! I am going to discuss a series of foils that have been produced for almost 20 years now. I am speaking of none other than the judge foils. As of April 2017, there are currently 109 different judge foil cards produced for Magic back from 1998. The popularity of the judge program foils has only grown over the years and you can expect this type of promotional foil to be around for many years to come. So what are these foils? Judge foils are exclusive promo foil reprints of cards from Magic: the Gathering history that Wizards has deemed worthy of reprint or upgrade. Many have the judge logo printed at the bottom of the card (akin to the FNM promo logo). A decade ago, the cards were selected based on popularity and rarity. Now, they are leaning more towards powerful, expensive EDH reprints as well as much needed Portal: Three Kingdoms overpriced cards. A mixture of rarity and desirability tend to be the deciding factor on which cards become Judge Foils. They are often legal or viable in various formats but not necessarily universally playable. There have been several methods of distributing these foils over the years from attending conferences to the more current Exemplar program. I will not delve into the method of distribution. Rather, I will be reviewing my top 10 favorite fudge promos and giving details on price and where to use them. Balance is one hell of a Magic card. Since the days of 1993, this card has been touted as white’s most powerful spell. Only being legal as a 1-of in Vintage, Balance joins the ranks of only several cards that are too powerful for Legacy AND Commander. Balance’s name may be a misnomer regarding its functionality, but the amazing artwork here by Kev Walker shows a powerful scene. 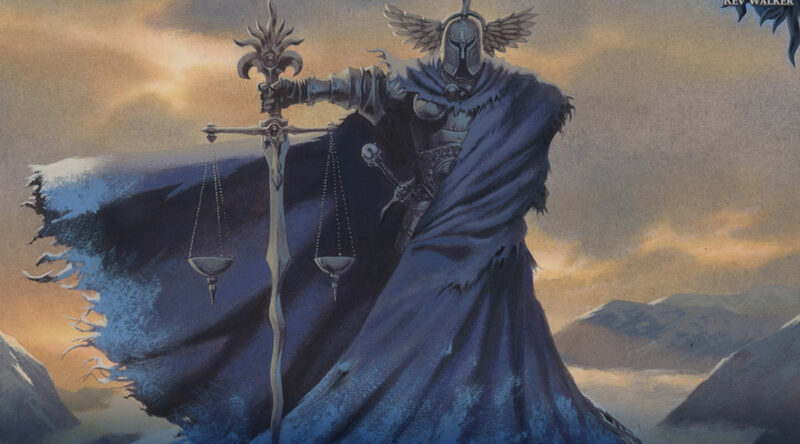 This is one of the cards that truly evokes the feel of a “Judge” foil to me because when I look at it I am reminded of the crucial role that judges play in balancing our game. Without judges, there would be no Magic events and this amazing artwork as well as the subtle foiling and colors leads to the stern, but fair feel you can get from officials. I use Balance in my Cube and it performs as one of the most overpowered White spells. Aside from Cube, some players play it in control decks in Vintage. Not being legal in other formats makes this card relatively cheap for a somewhat rare promo, but if it was legal in say, EDH, I would wager this to be the best version to use. Of course Alpha/Beta versions are pricier and the artwork is more nostalgic and iconic, but this version is the only viable foil version. We won’t talk about the FTV abomination. You can’t play much Magic without hearing about Sol Ring. From the most cutthroat and powerful formats like Vintage to the more casual but vast format of Commander, Sol Ring has touched more players than most cards on this list. Sol Ring sees play in my Cube as one of the best cards and top picks, which is quite a title. Many Vintage decks also include it as an additional way to boost mana. This is also the MOST played Commander card by far showing up in over 60% of ALL EDH decks. 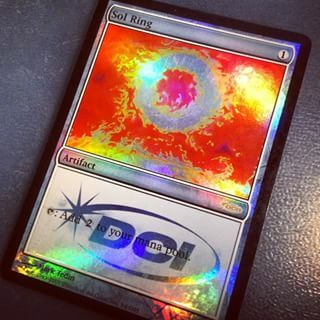 Sol Ring is a frequently sought after foil, and since the judge foil printing there have been 2 other foil versions. The judge foil Sol Ring uses the incredible Mark Tedin artwork from Alpha and it doesn’t get much better than that. The FTV foil displays the newer Commander artwork, and while nice, it doesn’t do justice to the original. There is also the Masterpieces version of Sol Ring done by the talented Volkan Baga. His artwork is stunning and the attention to detail he learned from his master Donato Gaincola is wonderfully displayed on the Masterpieces version. Currently, I replaced the Judge Sol Ring in my cube for the Masterpieces but it is still super close. The powerful alternative to this judge foil is why this card only Rings in at number nine. 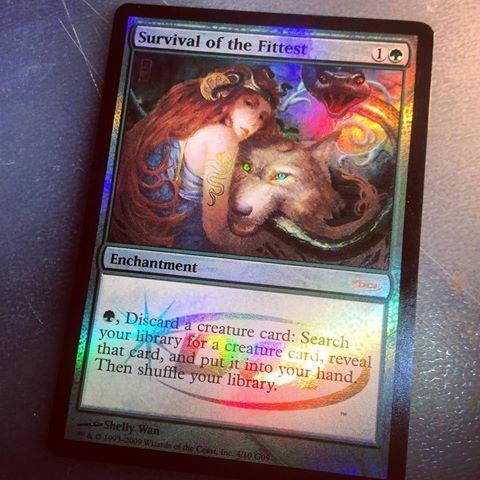 Survival of the Fittest is one of many judge foils on the Reserved List. 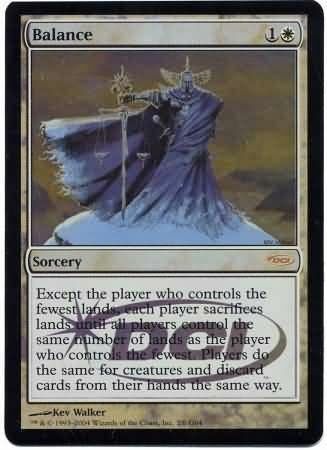 In fact, an older stipulation of the Reserved List allowed for foil promotional versions of its cards to be printed as long as they were not mass produced. This seemed to go by fine with players and collectors alike until the mass production of the From the Vaults: Exiled (and the printing of other reserved list cards en mass) caused one final revision to the list to not allow reprints of any kind. Luckily for us, some cards previously unavailable in foil were made as judge foils, and sadly, these will be the last. Survival of the Fittest is one of green’s most powerful spells ever printed. Released in Exodus, there were no official pack foils of this card available yet. Its status on the Reserved List indicates that the two options we currently have for this card are the only two we will ever get. While I do enjoy the artwork on the original Pete Venters version, the artwork on this foil is absolutely beautiful as well. There is a test print foil version with the original Exodus artwork but that is not reasonable to acquire for most. Survival of the Fittest sees play in my Cube where its ability to tutor for utility creatures and combo with reanimation spells is paramount. This card also sees heavy play in Commander where it serves a similar function. As Survival is banned in Legacy and not powerful enough for Vintage, you will be restricted to these two formats for the most part to use this card. I love this judge foil but it’s inferior artwork is what prevents it from climbing the list higher than number eight. 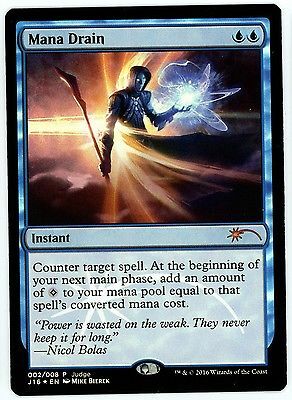 Mana Drain is one of the strongest blue spells ever printed. It was an uncommon in Legends so it is safe from the clutches of the Reserved List. The biggest story of this particular promo is its price. When it was first spoiled it was also released to a select few individuals. The first copies of these Mana Drains sold for over $1000 each which was absolutely crazy for a judge foil. In early 2016 these were still selling for around $800 at the few dealers who had them. Upon its official release copies of Mana Drain started off at $350-400 before falling to $250. Now, Mana Drain judge foil currently sit around $150-175 where I believe they will remain for the coming years. It is still prone to additional reprints. The Mana Drain judge foil comes with amazing artwork shown off originally in the Magic Online Holiday Cube. The original Legends artwork from Mark Tedin is a classic, however it sports no foil version. The colors on this foil are amazing and I recommend if you have to stick to one color for Judge Promos, go with the blue ones. Mana Drain is the best counterspell in Commander by far. Although, like the previous cards on this list, it is banned in Legacy, Mana Drain is also played in Vintage. I currently have a judge foil Mana Drain in my Cube and I don’t suspect it will ever be removed. Noble Hierarch is one of six judge foil released in the older frame. All six cards previously only came with the new border introduced in Eigth Edition, and because they have the same artwork as their original printings, Wizards wanted a way for them to stand out. Of these old framed foils, Noble Hierarch is my favorite. The foiling process is a flawless replication of old green foils and the colors are perfect. Noble Heirarch sees play as 4-of copies in Modern, Legacy, and even occasionally Vintage. It is nothing short of a staple and most likely the best mana dork ever printed (usurping the title from Birds of Paradise). Only Deathrite Shaman could give Noble a run for it’s money, but it is certainly close. Noble Hierarch is a cube staple as well and fits into any EDH deck that can slot Bant cards in. There are currently no other options artwork-wise for Noble Hierach, but I am not complaining. This piece by Mark Zug is nothing short of a masterpiece and I am a sucker for the old borders. This certainly gives the edge to the judge foil over its Conflux and Modern Masters 2015 printings. Fetchlands are absolutely the best mana fixing cycle in all of Magic. Original dual lands be damned, fetchlands have changed the landscape of the game forever. There is no format that exists where fetchlands aren’t the most used mana fixing and because of this, they have been printed numerous times. Unfortunately, for those of us who enjoy uniformity, there are only five judge foil fetchlands. They were printed for the allied color combinations right around the same time the enemy colored fetches from Zendikar were being released. Sporting the original artwork from Onslaught, these lands look amazing on the battlefield and the image itself glows extremely bright on the Delta and Strand. Because of the Expeditions series released in Battle for Zendikar, there are now alternatives to these judge foils. Additionally, the original frame from Onslaught (the last block with this frame) is simply amazing and blows even this judge foil out of the water. These fetchlands, while outclassed, just look incredible when played and I hold them in high regards with a number five spot. And here we have Lightning Bolt. 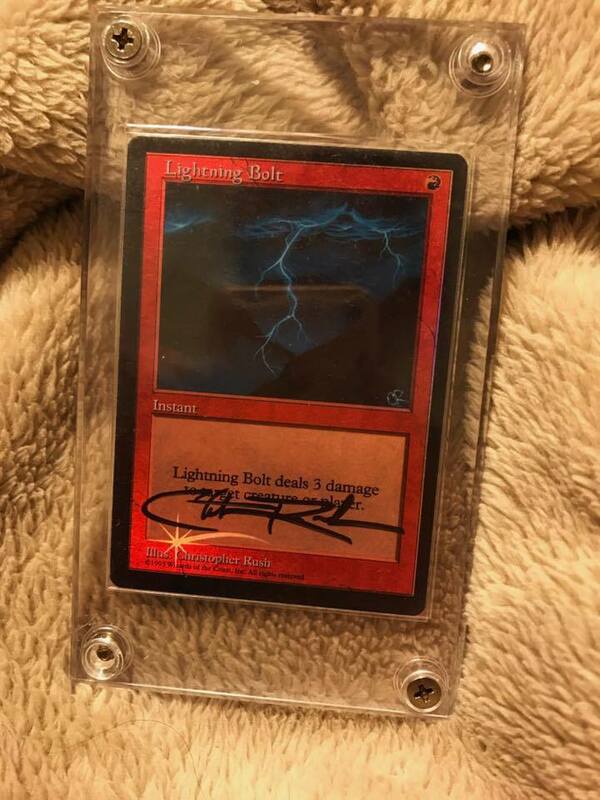 If you asked a person who hasn’t played Magic in 20 years what Lightning Bolt does they would still remember. Lightning Bolt just simply is Magic. This is the most powerful Red spell ever printed and a staple removal spell in every format it is legal in. Needless to say, every Magic player will need to own a playset of this amazing common. Lightning Bolt currently has over a dozen printings, so choosing the version for you can be tricky. Artwork-wise there are three different ways to foil your bolt. Christopher Moeller’s Core Set Bolt is a great piece, but the price is minuscule and it has been reprinted into oblivion. There is also the digitally illustrated Player Rewards Promo which is more affordable than the judge foil and extremely detailed. However, Christopher Rush’s artwork is iconic and combined with that juicy old 90’s frame THIS is how you deal 3 damage in style. As far as foils go, these are the most expensive basic lands in the game. Illustrated by the extremely talented and oft-considered best artist in Magic, Terese Nielsen, these judge foil basic lands combine to create a beautiful panorama artwork. Needless to say, they look amazing side by side. The rarity of these basics in large numbers, along with the demand for basics (hey we all need them) make acquiring these basic lands a journey in and of itself. Naturally, there are endless options when it comes to basic lands (an article for another time) and these are quite pricey. The foiling process on these is pristine and the nature of them being full-art also adds to their appeal. Wizards will have a very hard time ever topping these if they ever return to make more Judge Basics. I absolutely LOVE Judge Basic lands and am always looking to acquire more. Basic lands tell us a lot about a player and these basic lands certainly indicate opulence and good taste. Number three is a great place for these beauties. Here is it. The holy Grail of judge foils. Gaea’s Cradle commands the highest price tag of any judge foil and for good reason. 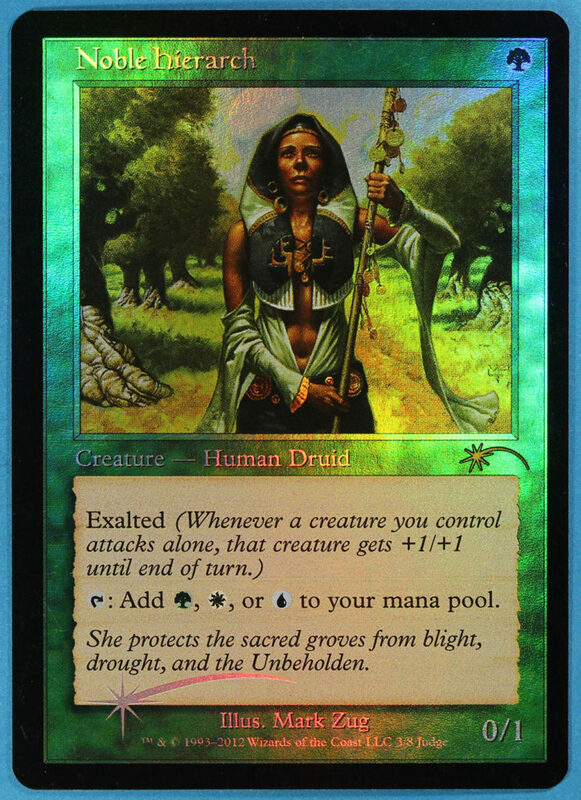 Gaea’s Cradle is on the reserved list, so you can bet this is the only way you will ever be able to acquire a foil one. The artwork by Mark Zug would be impossible to best anyways as I consider it a top 25 MTG artwork of all time. Gaea’s Cradle sees play in Legacy in Elves and is arguably the best land in Commander. I currently own one of these gorgeous Cradles in my Cube where it will live the rest of its long life. You are looking at spending close to $600 for one of these prestigious foils and I don’t expect that price to go down ever. This judge foil was released almost 20 years ago as one of the first of its kind and Urza’s Saga was the last expansion that didn’t include set foils. 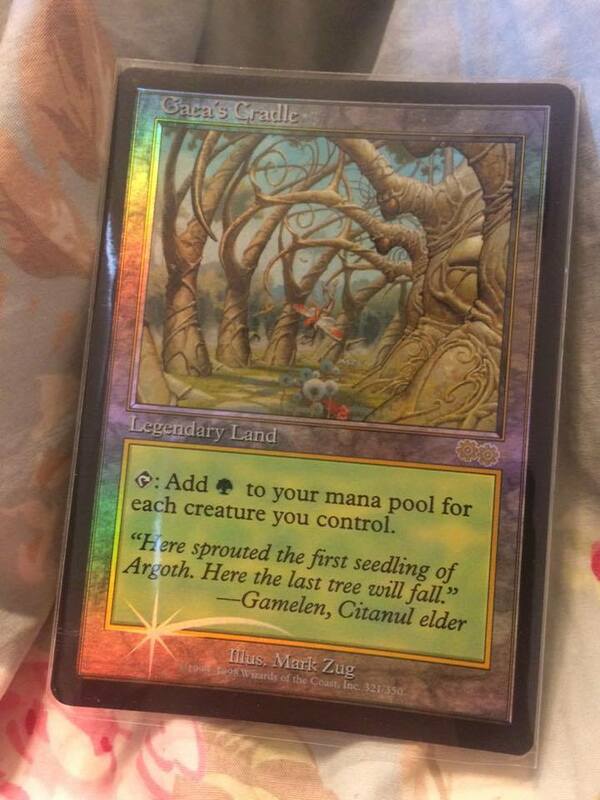 Wizards luckily managed to find a way to sneak Gaea’s Cradle in as a foil and we are all luckier for it. This beauty is worthy of its number 2 spot. It may seem impossible to beat out Gaea’s Cradle but here we are. When making this list I could think of no other card for the number one slot. The judge foil Elesh Norn is truly a work of art from the amazing artwork by Igor Kieryluk to the Phyrexian text on the card. This process is unique solely to this Elesh Norn, and with its popularity, I wouldn’t be surprised to see this again in the future. This Judge Promo is hard to find and super desired by casual players and avid collectors alike. For this reason it demands the second highest price tag of all judge foils, only behind Gaea’s Cradle. You will be paying around $500 a pop of these so it’s a good thing most players will only need one copy. 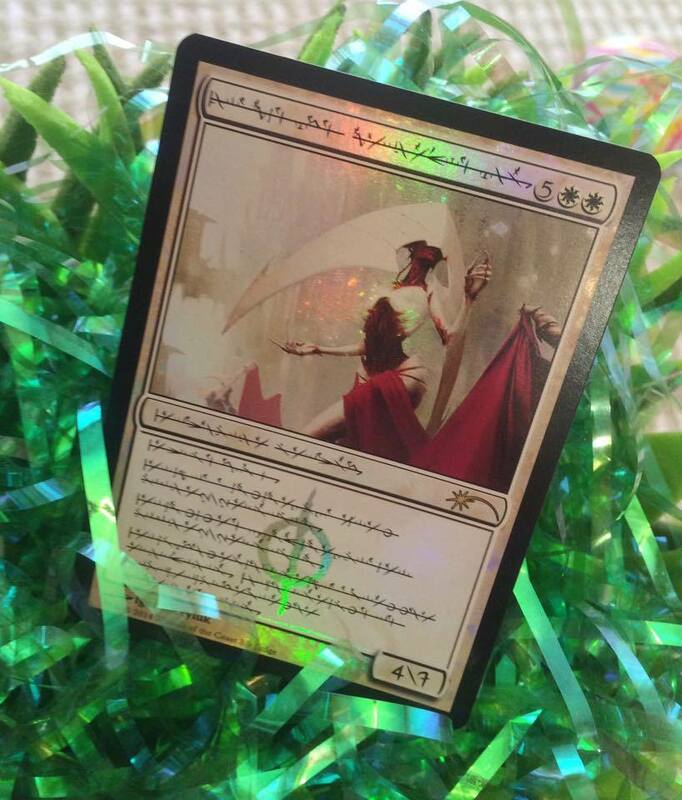 Elesh Norn is used in Legacy Reanimator and Dredge decks as well as Modern Gifts and EDH decks aplenty. If I could own NO other judge foil ever, this is the one I would choose as there is simply no alternative to me. This Phyrexian Princess currently resides in my Cube, and despite having real Power Nine cards present in the Cube alongside it, I always have a hard time not just sleeving this up in a binder and never taking it out. Elesh Norn blows away the competition and I hope we see more Phyrexian cards in the future! I hope you enjoyed my Top 10 judge foil rankings. 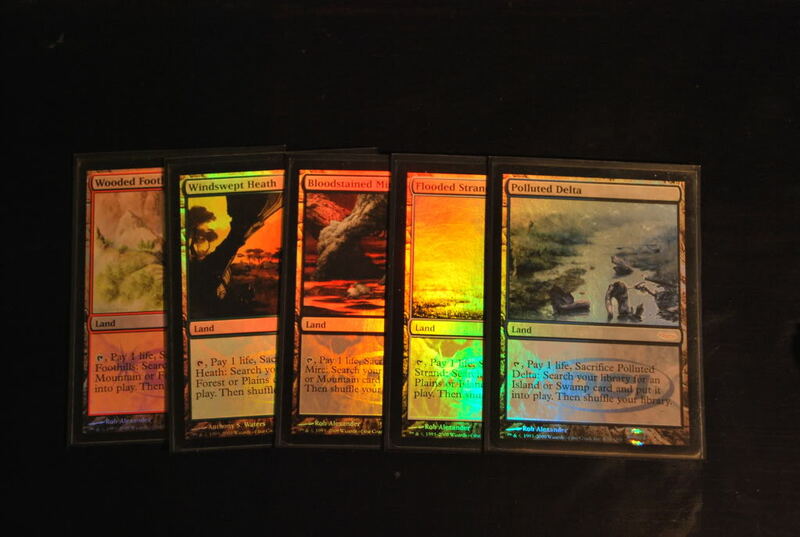 I am eager to hear which foils are your favorites and which ones you think should have made my list. Thanks for reading! Great article, one note and one question. The most expensive basics (as far as I know are Guru lands but I do agree that the judge foils look better). I used to flip a lot of judge foils and they were always rare and in demand. The appreciated and held value really well (outside of RL and A/B/U, these felt really safe). However after EMA, a few of them got hosed based on Wizards willingness to reuse artwork or even provide better artwork. For reprints, the examples are Karakas, Mana Crypt, doubling season, Damnation and for better art it is FOW, Masterpiece sol ring, SoFaI) just to name a few. A few of my judge foils got hit really hard and now have been hesitant to pick up newer ones. Thoughts as to whether the ones above or judge foils in general are still a fairly safe bet? Thanks for drawing my attention to that Mana Drain. It would be perfect for my Nicol Bolas EDH deck. Perfectly nefarious, that is. I do remember that when the judge foil Force of Will first came out. It was very expensive and noted as the first foiled version of the card. Then along came EMA (with Terese Nielson art) and it brought the value crashing. The same holds true for others like “Show and Tell”, “Shardless Agent”, etc. My feeling is, go for these judge foils if you need it for an existing deck and want to pimp it. But if you’re buying for a collection, there’s no harm to put those purchase on hold.